Grammy has launched its exclusive limited edition watch called i-Gucci. The watch is designed by the creative designer Frida Giannin in partnership with Gucci. 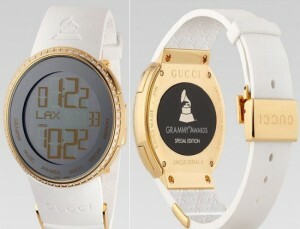 A strap changer facility watch that has a Grammy and Gucci logo features a new yellow PVD stainless-steel case. The gold dial is 1.37 carats with 55 diamonds studded at the edge. The design comes in two different sizes — the small, which measures 30 millimeters and the larger 44 millimeter version. The diamond studded watch is going for $7,900 and a cheaper version is for $1,345.